Sir Alexander Matthew Busby, CBE, KCSG (26 May 1909 – 20 January 1994) was a Scottish football player and manager, who managed Manchester United between 1945 and 1969 and again for the second half of the 1970–71 season. He was the first manager of an English team to win the European Cup and is widely regarded as one of the greatest managers of all time. Before going into management, Busby was a player for two of Manchester United's greatest rivals, Manchester City and Liverpool. During his time at City, Busby played in two FA Cup Finals, winning one of them. After his playing career was interrupted by the Second World War, Busby was offered the job of assistant coach at Liverpool, but they were unwilling to give him the control over the first team that he wanted. As a result, he took the vacant manager's job at Manchester United instead, where he built the famous Busby Babes team. Eight of these players died in the Munich air disaster, but Busby rebuilt the side and United won the European Cup a decade later. In a total of 25 years with the club, he won 13 trophies. Busby was born to Alexander and Helen "Nellie" Busby (née Greer) in a two-roomed pitman's cottage in the mining village of Orbiston, Bellshill, Lanarkshire. When he was born, Busby's mother was told by the doctor, "A footballer has come into this house today". Busby's father was a miner, but was called up to serve in the First World War, being killed by a sniper's bullet on 23 April 1917 at the Battle of Arras. Three of his uncles were killed in France with the Cameron Highlanders. Busby's mother was left to raise Matt and his three sisters alone until her marriage to a man called Harry Matthie in 1919. During the Second World War, Busby served as a football coach in the Army Physical Training Corps, and the experience resulted in Liverpool offering him the job of assistant to their then-manager George Kay. However, the experience had also forged Busby's opinions about how football should be played and governed, and when it became clear that they differed from those of the Liverpool board, their chairman Billy McConnell allowed Busby to pursue alternative employment. After Manchester United had tried to sign Busby from Manchester City in 1930, he became good friends with United's fixer, Louis Rocca; their relationship was helped by the fact that both were members of the Manchester Catholic Sportsman's Club. United were in desperate need of a manager to take over from club secretary Walter Crickmer after the war and a board meeting was called in December 1944 so as to ascertain who that new manager might be. Knowing that Liverpool had already offered Busby a job, Rocca convinced the United board to "leave it to [him]" and immediately wrote a letter to Busby, addressed to his army regiment. The letter was vague, referring only to "a job", just in case it fell into the wrong hands, namely the Liverpool officials. In February 1945, still in uniform, Busby turned up at Cornbrook Cold Storage, one of the United chairman James W. Gibson's businesses at Trafford Park to discuss the contents of Rocca's letter with the chairman. Busby requested that he be directly involved in training, pick the team on matchdays and even choose the players to be bought and sold without interference from the club directors, who, he believed, did not know the game as well as he did. Such a level of control over the team was unprecedented in the English game, but the United chairman was in no position to argue. Busby was originally offered a three-year contract but managed to secure himself a five-year deal after explaining that it would take at least that long for his revolution to have a tangible effect. The two men immediately put their mark on the side, leading them to the runners-up spot in the league, behind Busby's former employers Liverpool, by the end of the 1946–47 season. Manchester United were runners-up in the league in 1947, 1948, 1949 and 1951, and won the FA Cup in 1948, before winning the league championship in 1952. This was a welcome success for a club which had last won a major trophy in 1911 and had spent the interwar years bouncing between the First and Second Divisions. By 1952, however, the side captained by Johnny Carey, was beginning to show its age, and a new set of players had to be found. Busby, who had achieved a great deal of success in spite of his lack of previous managerial experience, was expected to spend large sums of money on high-profile players. Instead, he gradually replaced the older players with players as young as 16 and 17. These included right-back Bill Foulkes, centre-halves Mark Jones and Jackie Blanchflower, wingers Albert Scanlon and David Pegg and forward Liam Whelan. Among them was Duncan Edwards, judged by many to be England's finest player of his era, and capped by England at 17 – setting a record for the youngest-ever full international that remained unbroken for more than 40 years. He made relatively few signings from other clubs between 1951 and 1957, rare examples being winger Johnny Berry, forward Tommy Taylor and goalkeeper Harry Gregg. In 1956, just after United won another league title, Busby was offered the Real Madrid managerial role. The Real Madrid president at the time, Santiago Bernabéu Yeste, told him that the role was "like managing paradise". 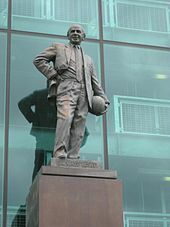 Busby responded by refusing the job and adding "Manchester is my heaven". Busby and his team began the 1957–58 season full of ambition for an assault on the Football League title, FA Cup and European Cup. On the way home from a European Cup tie against Red Star Belgrade on 6 February 1958, their plane crashed on the runway at Munich-Riem Airport. Seven players and three club officials were among the 20 people who were killed at the scene; Duncan Edwards died from his injuries two weeks later as the final death toll reached 23, while two other players were injured to such an extent that they never played football again. Busby suffered multiple injuries and twice received the last rites, but he recovered from his injuries and left the hospital after nine weeks. He was not aware of the extent of the Munich tragedy until some three weeks after the crash, as doctors felt he was not strong enough to know the truth until then. Sometime around the end of February, he asked a Franciscan friar at the hospital how Duncan Edwards was faring; the friar was unaware that the news of Edwards's death had been kept from him and felt that it was his duty to inform Busby that Edwards was dead. His wife Jean then had to tell him of all the other players and officials who had lost their lives. He reportedly told his wife that he felt like quitting the manager's job, as he had feelings of guilt over the disaster. Busby had gone against the wishes of Football League officials by pressing for Manchester United's participation in the European Cup and had not felt able to challenge the aircraft's pilot about taking off in heavy snow. Jean urged him to carry on with his duties in honour of the players who had died. Busby also had to face the torment of player Johnny Berry – who suffered career-ending injuries in the crash – complaining that Tommy Taylor was a poor friend for not visiting him in hospital; unaware that Taylor had been killed, while Busby had been urged to keep the news from Berry at this stage, which he found particularly difficult. Busby had been appointed the manager of Scotland before the Munich disaster. Dawson Walker took charge of the team during the 1958 World Cup instead. After recovering from his injuries, Busby managed Scotland in two games later that year against Wales and Northern Ireland. Busby gave an 18-year-old Denis Law, then with Huddersfield Town, his first Scotland cap. He had already expressed an interest in signing Law for United by this stage, although he had yet to be successful in doing so. Matt Busby suffered a mild stroke in July 1980 at the age of 71 but made a full recovery. Soon afterwards, however, his wife Jean became ill with Alzheimer's disease. She died, aged 80, in December 1988 in a Manchester nursing home. They had been married for 58 years. Matt Busby was the subject of This Is Your Life on two occasions, in January 1958 (a month before the Munich tragedy) when he was surprised by Eamonn Andrews at the BBC Studios in Manchester, and in May 1971, when he became the first This Is Your Life subject to be honoured for the second time. On this occasion, Andrews surprised him just ahead of his final game as interim manager, leading Manchester United in a derby match with Manchester City at Maine Road. Busby was mentioned, along with B.B. King and Doris Day, in the Beatles song, "Dig It", on the album Let It Be, released in 1970. He died, aged 84, on 20 January 1994 at The Alexandra Hospital in Cheadle, Greater Manchester. He had been admitted to the hospital earlier that month to have a blood clot removed from his leg, and had appeared to be making a good recovery until his condition deteriorated after several days. He was buried in Southern Cemetery, Manchester, alongside his wife Jean. His racecourse owner friend Willie Satinoff, who died in the Munich air crash, is buried in the same cemetery. Two days after Busby's death, a minute's silence was held at the start of United's home game against Everton in the Premier League. United finished that season as double winners, lifting the league title and FA Cup. In 1999, in securing the treble of Premier League, FA Cup and European Cup, Manchester United won the European Cup on what would have been Sir Matt's 90th birthday - the first time they had won the trophy since Sir Matt's 1968 triumph. Then, in 2008, Manchester United won the Champions League again, 50 years after the Munich tragedy, and 40 years since his own triumph in Europe in 1968 where Busby's United defeated Benfica. The day after the 100th anniversary of Busby's birth, Manchester United played Barcelona in the 2009 Champions League final and lost to the Spanish side 2–0. Busby was made an inaugural inductee of the English Football Hall of Fame in 2002 in recognition of his impact on the English game. The sports centre in Bellshill, his place of birth, was named after him shortly after his death. This opened to the public in 1995. Brian Cox portrayed an older Busby (and Charlie Cook a younger Busby in flashbacks to 1958) in the 2013 film Believe. Set in 1984, Busby takes on the management of a boys' team entering in a local cup competition. ^ "Greatest Managers, No. 7: Sir Matt Busby - ESPN FC". Espnfc.us. 7 August 2013. Retrieved 17 September 2016. ^ "Matt Busby". www.liverpoolfc.com. Liverpool FC. Archived from the original on 1 January 2016. Retrieved 14 October 2015. ^ "Sir Matt Busby profile - Official Manchester United Website". Manutd.com. Retrieved 17 September 2016. ^ Football (2 February 2008). "Matt Busby's philosophy the stuff of legend". London: Telegraph. Retrieved 18 December 2012. ^ Philip, Robert (2 February 2008). "Matt Busby's philosophy the stuff of legend". The Daily Telegraph. London. ^ Murphy, Alex (2006). The Official Illustrated History of Manchester United. London: Orion Books. pp. 62–63. ISBN 0-7528-7603-1. ^ "Matt Busby". LFCHistory.net. Retrieved 24 October 2009. ^ "Matt Busby". Londonhearts.com. London Hearts Supporters' Club. Retrieved 1 December 2011. ^ "Charlton remembers 'greatest ever'". Sportsnet.ca. 1 February 2008. Archived from the original on 7 February 2009. Retrieved 24 October 2009. ^ "Edwards had everything but time on his side". Reuters. 1 February 2008. Retrieved 24 October 2009. ^ Wright, James (7 November 2003). "Greatest England XI - Sir Bobby Charlton". TheFA.com. The Football Association. Retrieved 24 October 2009. ^ a b c d "Matt Busby". www.scottishfa.co.uk. Scottish Football Association. Archived from the original on 31 August 2017. Retrieved 20 November 2013. ^ a b c "1969: Matt Busby retires from Man United". BBC On This Day. BBC. Retrieved 14 October 2015. ^ "Busby ends career as soccer coach". New York Times. 15 January 1969. p. 52. Retrieved 25 April 2009. ^ "Matt Busby; Soccer Coach, 84". New York Times. 21 January 1994. Retrieved 25 April 2009. ^ "Search online | Burial records | Manchester City Council". Burialrecords.manchester.gov.uk. Retrieved 17 September 2016. ^ "Sandy Busby passes away". ManUtd.com. Manchester United. 15 September 2014. Retrieved 15 September 2014. ^ Hibbs, Ben (29 May 2015). "Sheena Gibson, daughter of Sir Matt Busby, passes away". ManUtd.com. Manchester United. Retrieved 30 May 2015. ^ Dingwall, John (6 February 2011). "Pride and passion behind Dougray Scott's portrayal of Sir Matt Busby". Sunday Mail. Retrieved 25 April 2011. ^ a b "Sir Matt Busby's son 'disgusted' at United TV film". BBC News. BBC. 24 April 2011. Retrieved 23 May 2011. ^ a b McCahill, Mike (24 July 2014). "Believe review – Brian Cox stars as Man United's Matt Busby". The Guardian. Guardian News and Media. Retrieved 8 August 2014.